Kite-borne view through several cm of water showing two general classes of fresh trails. 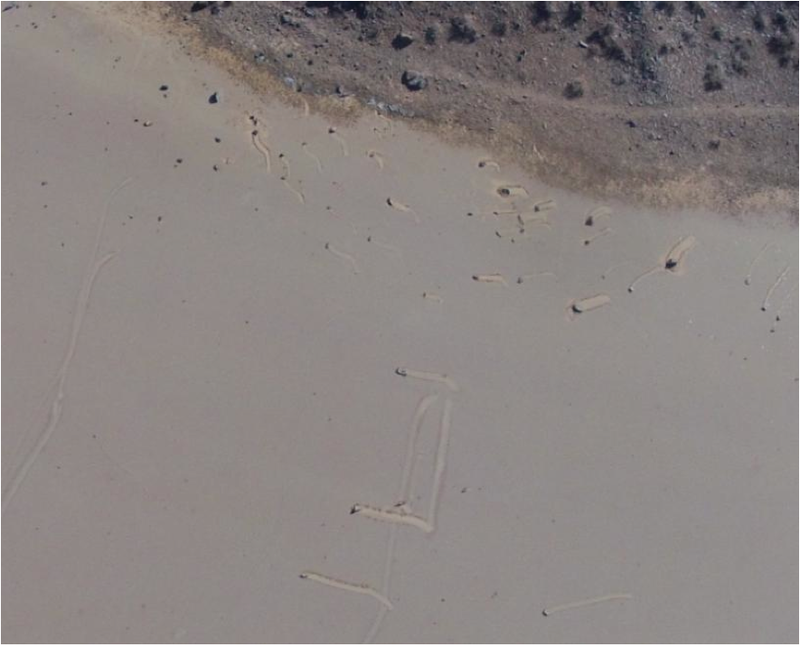 After several decades of study and observation, the sailing stones of Racetrack Playa have been observed in motion! During winter 2013-2014, members of our group were present while the playa was flooded and frozen. A steady wind drag moved the thin ice sheets covering the playa’s south end, and these sheets pushed the rocks along, creating the characteristic furrows in the playa’s muddy surface. We’ve posted live videos of the rock movement and time-lapse images of the winter, linked below. Links to the scientific publications reporting these observations are also below. Contact Brian Jackson (bjackson@boisestate.edu) for questions about the website. A google news search turns up a lot more. Several videos are available on our youtube channel and on Scripps’ channel. These videos are also available on youtube: How Rocks Move and The Racetrack Playa’s Sliding Stones. Sliding rocks on Racetrack Playa, Death Valley National Park: first observation of rocks in motion. R. Norris et al. (2014) PLOS ONE. Contact James Norris (jim@interwoof.com) for further images, timelapse series and data. 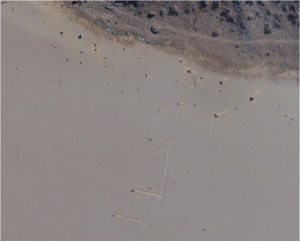 Trail formation by ice-shoved “sailing stones” observed at Racetrack Playa, Death Valley National Park. R. Lorenz et al. (2014) Submitted to “Earth Surface Dynamics” (see the open discussion on the paper here). Principal images from Lorenz et al. (2014) — Figures 1-6 by Ralph Lorenz, Figure 7 by Jim Norris. Images may be used freely but must include a prominent caption crediting the photographer and citing www.racetrackplaya.org and/or the ESurfD paper as source. Contact Ralph Lorenz (http://www.lpl.arizona.edu/~rlorenz) for further timelapse, kite, and other images and data. Left frame acquired at 09.16h on 9 Jan 2014, Right frame at 12.08h. The central small rock in the foreground was observed in motion by J. Chadbourne (see above video). Declining rock movement at Racetrack Playa, Death Valley National Park: an indicator of climate change? R. Lorenz & B. Jackson. Geomorphology (2014). Wandernde Steine — an impressive school science project by Ronja Spanke of Germany (shared with permission). Some other papers at http://www.lpl.arizona.edu/~rlorenz.